Clear plastic tubes and soft vinyl caps are frequently used by cutting tool companies to prevent damage to their valuable industrial cutting tools during shipping and handling. 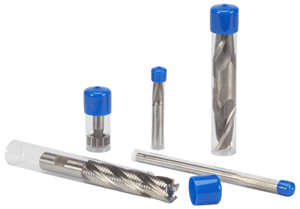 Packaging tubes for cutting tools provide an inexpensive system to protect industrial tools small and large from the manufacturing floor to the retail display, wholesalers, or direct customers. Soft vinyl caps are tight fitting to ensure tools stay safely inside the tubes. These caps are available in vibrant colors which can help differentiate product lines and organize tool systems either at home or on the factory floor of industrial tool companies and end users. Petro also offers stock open end tubes in all 17 diameters for our customers who prefer to cut the tubes down to length themselves and package tools of various lengths. We offer no minimum order quantity on plugs, slip-on and vinyl caps if they are purchased with tubes!